Gerard Lyttle. Pic by PressEye Ltd.
Cliftonville manager Gerard Lyttle is hoping for some home comfort to see out the season following away-day agony in 2017. 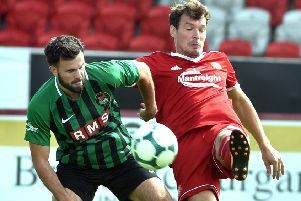 Lyttle’s Reds have lifted a single point from six road trips this year but now Cliftonville can aim to wrap up the season with a maximum haul back on familiar territory. “Small margins have gone against us at times this season and even Tuesday’s 4-1 defeat at Ballymena was harsh,” said Lyttle. “We want to end the season in the right way, playing with pride and passion, especially in front of our own fans. “With the play-offs coming up we want to stay hungry and keep up our focus. Glenavon visit Belfast with Rhys Marshall serving a suspension and manager Gary Hamilton aware of the disciplinary mathematics. “Then you can see the progress of a young player like Jordan Jenkins and it is about making the most of the squad across the board leading into the play-offs.